When I started in this business, I never expected the many twists and turns that were in my future. Those of us at the Vintage & Antiques Community on G+ do our best to inform our customers and assist our sellers. We cover business topics, social media, research, reproductions and fakes, photography, branding, customer service, accounting and much, much more. I don't think that any of us, thought that so much would change so quickly...but here we are. A quick list of tips to help you stay informed and in the game. No where to use those hashtags i.e. Instagram, Twitter, G+, Pinterest and the differences there may be between different hashtags on different platforms. Hashtag styles are a loose interpretation of original movements or styles i.e. an item may not be from the style time period, yet the common use of hashtags has made the name popular and it has now taken on new life. Normally, I would be against this but Internet has created a very large train that already left the station. The best we can do is explain the differences in our listings and/or posts. By example, would be Chinoiserie. The original meaning: Recreated designs, made in Europe, to mimic the very popular Chinese art/architecture movement of the 18th century. Technically to be Chinoiserie (Chinois is French for Chinese), they need to be made outside of China. These days, it means anything old, new or in between that has an Asian motif or style. Use the hashtags, but know the real meaning and include that in your listing. I've noticed that listings are getting shorter and shorter. Many times without any reference to timeline or history. In my opinion, save short and sweet for Twitter and Instagram. You want your listings to have information. Not everyone knows what they're buying and they're looking for a little bit more info than "Vintage Book Shelf - Looks Great! ":) Accurate measurements and a detailed description, shows that you care about what you're selling and that you care about your customers. We're all involved in many Social Media platforms. Try to give a little extra attention to two of them. Become involved, don't just post and run. If it's Instagram, let your customers know who you are aside from your vintage treasures. They want to see a story, a life...an actual person behind the business. If you're on G+, join some communities that interest you, apart from Vintage & Antiques. Have discussions, ask questions and expand your virtual horizons. Hello everyone! Have you ever been interested in that vintage piece of wood, leather or glass but decided against buying, as you were not sure how to preserve or clean it? Worry no more with these handy care tips kindly provided by this week’s guest blogger, Hannah Hutchinson. You likely already have a few classic interior pieces adorning your home. These stand out as focal pieces and really bring about the classical charm. Antique furniture and décor are also decades if not centuries old. This means the surface has seen its fair share of exposure. The good news is that with a little DIY care, you can retain the pieces’ original surface condition and overall quality. Do you own a rocking wooden chair or mahogany dresser acquired from your late grandparents’ estate? Wood has a cottage and rustic look, making them a mainstay in many classical interior design schemes. However, wooden surfaces aren’t the most durable. First, you need to frequently dust the surface. While airborne deposits may be barely visible, their buildup causes enough abrasion to scratch wood. Use a feather duster and lightly wet the feathers to avoid scattering the dust into the air. When it comes to cleaning, avoid all-purpose cleaners and refrain from using water. You may, however, use a bit of H2O to remove sticky stains. Use a product like silicone oil or a homemade mixture of olive oil, lemon juice, and denatured alcohol. Refrain from using any form of oil as a standalone cleaner. Too much raw oil exposure creates a surface susceptible to smears and smudges. Finally, you will need to provide a protective coating by applying polish or wax. Even furniture manufactured in a bygone era has remnants of sealant in some shape or form. Paste wax is a good choice and provides a durable coating that lasts upwards of two years. Leather has a reputation of being tough as nails and withstanding father time. Nevertheless, genuine leather is still susceptible to blemishes, ranging from fading to cracking. Some homeowners actually like the appearance of worn and aged leather as it exudes vintage-ness. If you prefer to keep your leather antique accessories looking smooth, though, then you’re going to have to put in some care. To care for leather, consider applying polish. This isn’t an absolute essential, as polish is mainly about acquiring that shiny and reflective look. There is, however, the secondary benefit of locking in moisture. Whether you decide to apply polish or not, you should definitely apply a conditioner. This also keeps the leather moisturized and will also have some degree of water-repelling capability. Most conditioners come in lotion form. Just rub in the lotion the way you would rub lotion on your own skin. Leather is porous and will absorb the compounds. Refrain from using soap or any detergents, even if it’s a diluted solution. Soap will absorb oil out of the leather surface. This is why your skin feels dry after washing with soap. The difference, though, is that human skin has living cells that replace the lost oil. Leather does not have that ability and will quickly lose its moisture if exposed to soap residue. Do you own a rare glassware set or vintage mirror? Glass is especially fragile. The surface is also prone to oxidation. This is not necessarily a bad thing as some people actually prefer the glass show a bit of its age. However, you should do your part to preserve its original elegance, especially if the glass is displayed in a cabinet or out in the open. Washing normal glass is pretty simple. Just rinse in hot water with a mild detergent solution. If cleaning crystal glassware, on the other hand, then the process differs slightly. Only wash crystal glass by hand. Use a mixture of lukewarm water and mild detergent. Follow up with a rinse of vinegar and water. How about cleaning pure crystal? Make a paste of white vinegar and sea salt. Apply the paste on the crystal surface and let sit for 10-minutes. Rinse using a microfiber towel. If you happen to own one, you may elect to use an electric glass polisher. Classic interior pieces can easily last for centuries. Many vintage items from bygone centuries would not be sitting in museums and historical exhibits intact if they couldn’t withstand the sands of time. While they can last for ages, they do require upkeep on your end to maintain their quality as intended by the original manufacturer. Bijoux ... foulards ... gants ... accessories en folies !!!! 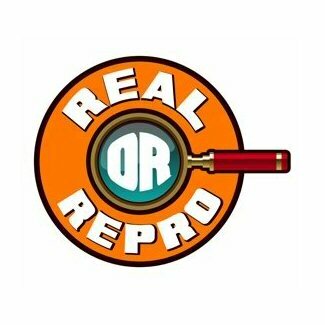 Your online source for identifying fakes and reproductions.